In BC and WotLK, I used to drive my Guild Leader crazy by a) spending too much time fishing, and b) spending too much time collecting pets. Basically spending too much time not optimising my gear and grinding rep. But it was fun! Collecting pets was completely different before MoP – it wasn’t about battling, it was about finding them in the wild as drops off mobs or bosses1, earning them from various tasks and quests, or buying them from vendors. Completing Higher Learning in Dalaran gave you a Kirin Tor Familiar, spending hours killing thousands of dragonwhelps for the elusive Dark Whelpling, or best of all, fishing up Mr Pinchy for the wonderful Magical Crawdad 2. You can still do all those things of course, but now Pet Battling has kind of taken over the pure collecting goal. To collect now, you have to do some Battles in order to have a team capable of capturing level 25 wild pets. And a Molten Corgi or equivalent to make sure you don’t accidentally kill your capture target. Shortly before MoP launched, I had gathered up around 100 pets for the Petting Zoo achievement, which was relatively high for the time. The remaining pets were hard to get and find, but I was slowly working through them. Then came Pet Battling and I pretty much stop collecting immediately. I did some battles up to about level 15, but then abandonded it completely. It’s hard to pinpoint what it was, but I think it was the sheer numbers. From an achievable list of ~150 hard to find pets to suddenly having to search for over 700 pets was overwhelming. It also meant learning a new game system that was completely isolated from the rest of the game. It wasn’t until now, in the dying days of Warlords, that I’ve decided to take another look at it. Battling is quite fun, and I have a small team of 25s that can start to take on anything found in the wild. 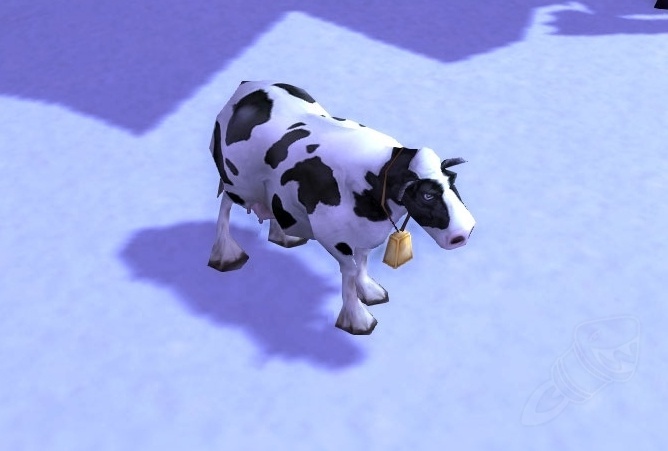 And I recently discoverd you can get a tiny cow pet, so now I’m obsessed. No self respecting Tauren would be without one!